The 2018 Winter Olympic Games are almost here, and that means coming together to cheer on Team Canada! This year’s Olympics will be held in Pyeongchang County, South Korea. Join us at the SLC throughout February 8th – 25th, as the events will be broadcasted in the Amphitheatre space. During this time, a portion of the Amphitheatre space can still be booked for Tabling activities. 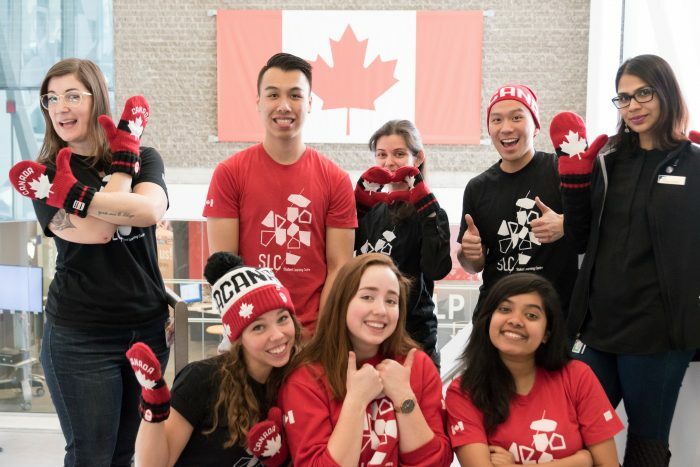 If you have any questions or concerns, please contact slchelp@ryerson.ca or stop by the Student Engagement and Leadership (SEAL) Team’s Headquarters in LIB272B. Looking for a unique gift this holiday season? 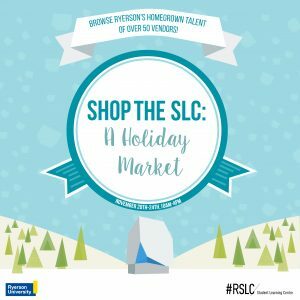 Shop the SLC is your on campus, one-stop shop for handcrafted gifts. As I looked out over the sea of yellow residence t-shirts and anticipating faces, I found myself thinking back to my residence move in day – three years ago. I was just like all of the first years in front of me, at my very first Ryerson pep rally with my new floor family, unsure of what the next few years had in store for me. Now, in my final year, I was standing in the middle of the crowd just as nervous, but this time, it was different. I was there to welcome the new students. 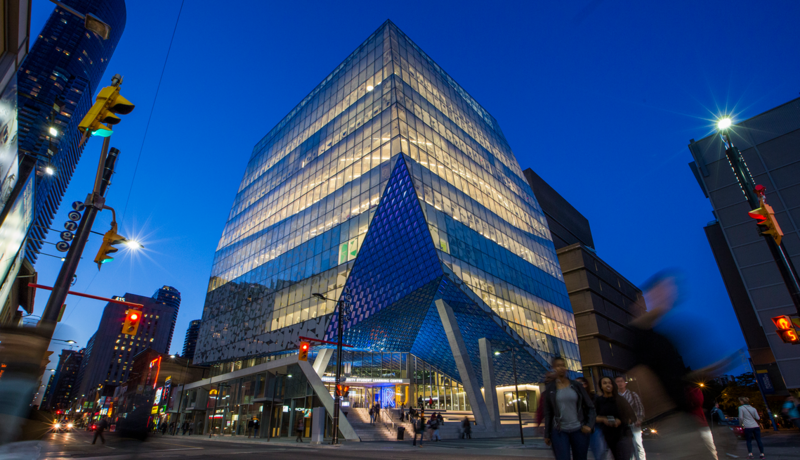 Since its opening, the Student Learning Centre has become a well-known place for encouraging student participation and enhancing their overall experience at Ryerson. Last year, the SLC introduced a new initiative inspired by these ideals called the SLC SEAL Team Student Engagement and Leadership (SEAL) Award. This award encourages students to be involved in the Ryerson community and to help enhance students’ experiences. One undergraduate and one graduate winner will be chosen to receive the award and the $1000 grant that accompanies it. I consider myself very lucky to have had the SLC for the entire span of my university experience. I couldn’t imagine navigating my post-secondary path without it. Yet that was the case for some of my upper-year peers. Curious about the pre-SLC student reality, I sat down with some of them to better understand how campus life has transformed since the SLC opened its front doors. 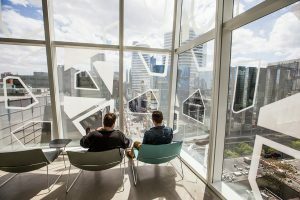 Ryerson’s campus has been in continuous expansion over the years, but what was missing was a space for students to just be. This is just one of the reasons the SLC was born! Step inside and you’ll immediately notice a versatile space dedicated to – and shaped by – students. It’s a place that has carved out a niche for every student, regardless of year or program. It truly is our SLC, malleable to our every need. I remember my first week of university. I was 17, five hours from where I grew up and living alone for the first time. To be honest, I did not know whether I was more excited or nervous. I came to Ryerson not knowing much about the campus, downtown Toronto or how to be a successful university student. I wish the Student Learning Centre had been open in my first week. If it were, I know exactly how I would’ve used it. On Thursday, September 29th from 1:00pm – 4:00pm they say we’re apathetic: a youth town hall to fix the voting system will take place in the southwest corner of the 6th floor in the SLC. Join a Canada-wide discussion on federal electoral reform at this student focused event or help us make our guests feel welcome by continuing to use the space as you normally would. This event is part of a series of roundtable discussions happening across Canada focussed on ensuring the voices of young people make it directly to Prime Minister Trudeau and the committee studying voter reform. It is hosted collaboratively by Ryerson Students Union, the University of Toronto Students Union and Leadnow. The SLC’s popularity has created a unique, yet challenging opportunity for us. 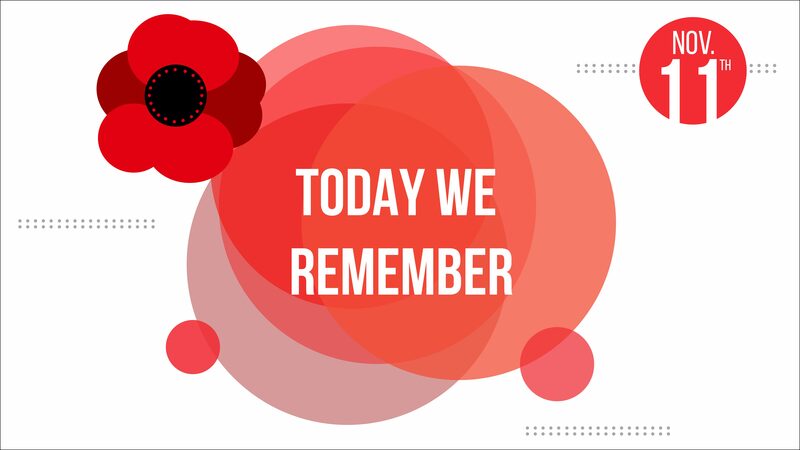 On September 29th there are two federal government events taking place in the SLC. With so much going on and not enough event spaces, a special exception is being made to bring this important student-led reform event to the 6th floor. This allows for all other student-led activities in the SLC to take place as originally programmed. It is exciting to see Ryerson partnering with government officials for important events like this one. We invite you to show them what makes the SLC and Ryerson special by either participating in the event or using the space as you normally would. Do you have ideas for creating a better student experience? 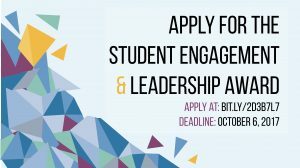 Are you interested in student engagement and innovation? Joining this year’s Ryerson University Library & Archives Student Advisory Committee (RULA-SAC) will allow you to contribute your feedback and ideas to the Library. Ryerson University Library & Archives is currently accepting applications for their RULA-SAC), a committee designed to facilitate direct communication between the Library and the students that it serves. This year, the focus is on student engagement. 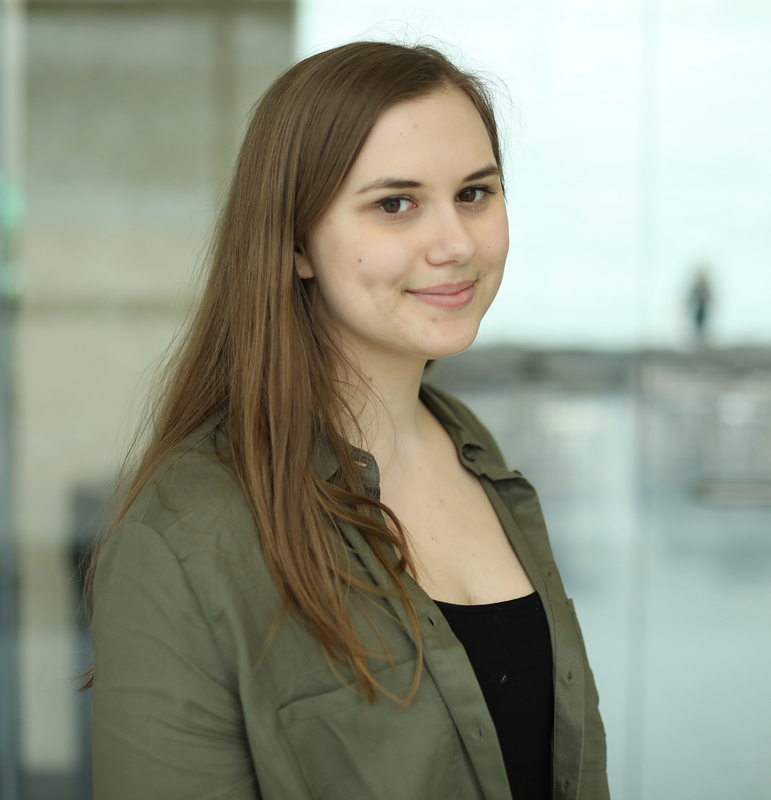 As the co-chair, Carrie-Ann Bissonnette wants to ensure that students are involved in shaping the campus culture at Ryerson. Together, you can take part in innovative projects that support the new Student Learning Centre (SLC). This includes the development of an SLC Ambassador Program to foster student engagement. You may also have ideas for the LIB Invigorate Initiative that revitalizes the Library and harmoniously infuses it to the new SLC. RULA-SAC welcomes undergraduate, graduate and continuing education students! 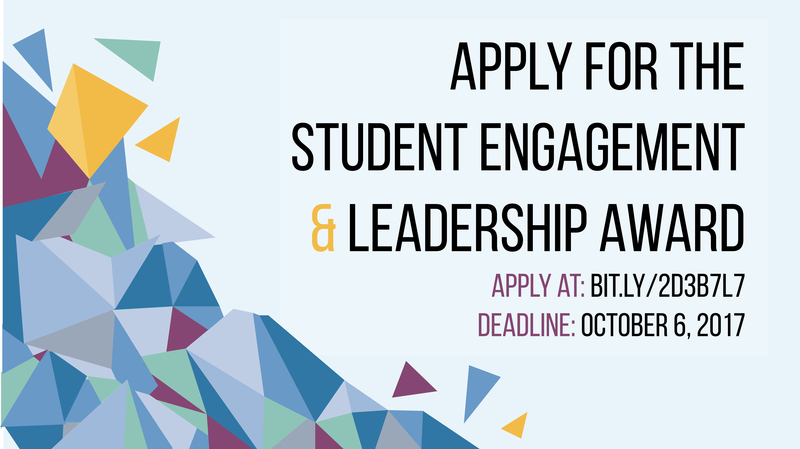 Apply by Friday, October 3rd, 2014 to join 15-20 other student leaders and put your ideas into action. Have questions? Click here to learn more or email rula@ryerson.ca.